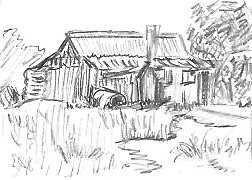 Learn How to Sketch - Easy Sketching for Beginners. 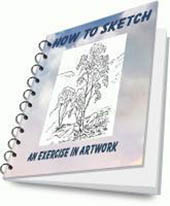 You will learn how to sketch in no time at all when you follow the clear instructions in this well thought out e-book. Author, Kerry Godsall, takes you by the hand and leads you through the simple and enjoyable process of developing easy sketches of such diverse subjects as animals, trees, people and buildings. She suggests using pencil sketches and plain paper to start with to avoid the possible distraction of having too many choices of materials, but points out that the principles that she shows you may be applied to sketches in other mediums, such as pen and ink, charcoal or colored pencil. 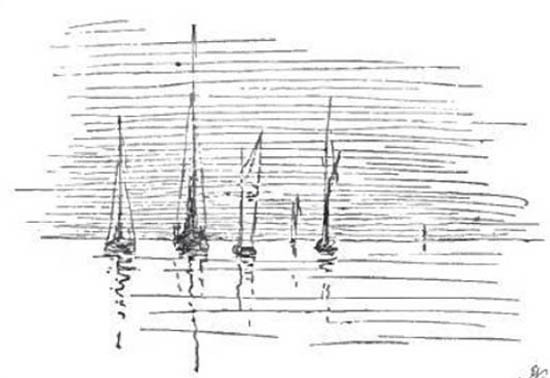 Kerry differentiates sketching from drawing and explains that sketching is rather like shorthand drawing, a skill in its own right and useful for recording quick impressions of a subject, whether that is a playful cat, a seascape or glimpses of trees by a shady creek. Simple lines, strategically placed, give the illusion of water and sky. Mostly for beginners, this new e-book is selling extremely well. If you are a complete beginner, who wants to learn how to sketch, then this book is for you. But if you already have a reasonable level of drawing and sketching competency you will probably benefit more from books directed at advanced students. Personally, I enjoyed reading the book and appreciated Kerry’s perception of how to sketch ‘from scratch’, something that she taught herself from years of research and practice. However it came as something of a surprise that there would be such a strong demand for this basic level of instruction because I can’t remember learning these skills myself – I just seemed to know them, rather like knowing how to speak and walk. So it would seem that some people develop sketching skills early, without trying, while others need to make a deliberate effort to unleash their latent ability – which is where Kerry’s knowledge and patience, coupled with her interest in helping you, comes in. Sketching skills lead to confidence and enjoyment. It seems to me, having read Kerry's e-book , that sketching is about gaining simple skills, such as which pencils to use for particular effects, how to quickly measure proportions, a basic understanding of perspective and how to create quick impressions for your own reference and enjoyment. By following the easy exercises and suggestions you will not only learn to sketch but you will grow in confidence. Perhaps this course, with its ‘baby steps’ would be a good ‘refresher’ for those many adults, who enjoyed art subjects in their youth and always yearned to take up the interest again, but are held back because they don’t know where to start. Once you have completed exercises, which teach you some of the types of strokes that can be made with various pencils, you will learn in which direction those strokes should go in order to better describe the character and form of an object. Fascinating stuff! That’s just the beginning of your journey, which will lead you through winding pathways of discovery and practice until you no longer wonder how to sketch – you will just know! Should you decide that this course is for you, Kerry generously includes several free e-books which complement it. I can see that you are going to have a lot of fun! I would be so interested to hear how you get on, so perhaps, when you have mastered a few of the techniques, you may like to return here and share your sketches and experiences with us?